Earlier I posted a card that was a CASE of the card in the My Paper Pumpkin Welcome Kit. My Paper Pumpkin is a new monthly subscription offered by Stampin Up! It is regularly $19.99 per month (which includes shipping) but as a promotion all subscriptions ordered before midnight Saturday (MDT) will be half price for the first two months. You can see the card and learn more about My Paper Pumpkin here. Today I have a card that uses the Hey My Friend stamp that comes in the Welcome Kit. The monthly kits all contain stamps and ink spots that can be the beginnings of or additions to a collection of papercrafting supplies. I wanted to show what can be done long after the consumables in the kits are gone and forgotten. Here is the card I made. 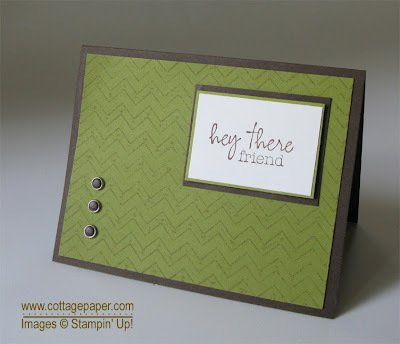 I “stamped” with my Chevron Embossing Folder using Chocolate Chip Classic ink on to Old Olive ink. This is my favorite new technique! I love the look and it is so easy. You can use any embossing folder. Rub your ink pad over one side of the embossing folder. For most folders you will need to decide which side you want to use depending on what look you want. For the some of the folders, including the Chevron Folder, the sides are symmetric and either side will produce the same result. Once you have inked up your folder, place a piece of cardstock into the folder and carefully close. Then press over the closed folder with your hand. You can use a brayer if you have one. The Classic ink tends to bead-up on the folder resulting in the small brown dots in the zig-zags. I have seen this done with VersaMark ink and since it is thicker, it does not produce the small dots. I like both of these looks! I then stamped the Hey There Friend stamp on Whisper White cardstock and layered it on Old Olive. I popped up these layers on the Chocolate Chip layer with Stampin’ Dimensionals. The three brads on the bottom left are made with Candy Dots attached to Brad Bases. Love Candy Dots!! If you want to take advantage of the promotion and order My Paper Pumpkin use the promo code PumpkinDeal after you click here. If you don't have a demonstrator please list me as your demonstrator.